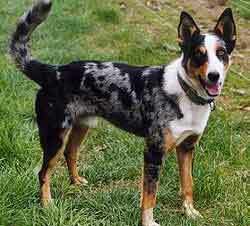 The Koolie is a medium-sized dog of varying coat type, usually with a merled coat pattern. Koolies are typically slightly longer than tall and resemble a cross between a Border Collie and an Australian Cattle Dog, dogs with whom they likely share ancestry. The Koolie is thought to be descended from the same Collie types that were brought to Australia for the kennels of Thomas S. Hall; some believe that they are the direct descendents of Hall's dogs. This, if true, would make the Koolie the oldest of Australia's breeds. The dog was originally referred to as a German Coolie or simply Coolie; theories vary as to why they were so called. It may be because German settlers used similar herding dogs, or from the word coolie used as an ethnic pejorative. To avoid unpleasant connotations and also so that the breed's Australian origins are not confused, the Koolie Club of Australia officially changed the breed name and most enthusiasts use the current spelling, although the variants are also seen. Koolies are much sought after in rural Australia. The Koolie will 'head', 'heel', and 'back', literally jump onto the backs of the animals they are herding if necessary. Koolies have a reputation for herding anything from ducks to bulls. A medium sized dog Koolies stand between 16 and 22 inches at the withers and generally weigh from 20 to 45 lbs. This site created and maintained by CATTLE TODAY. Copyright © 2019 Cattle Today, Inc.